A YOUNG man from a Glen Luss family rose to become a long-serving and controversial Town Clerk of Glasgow. Angus Turner, one of the Turner family who farmed at Edentaggart in the glen for over 200 years and who were supposed to be linked by marriage to William Wallace, was by all accounts quite a character. Angus was born at Greenfield Farm, Garelochhead, just inside what is today Greenfield Army Training Camp, on May 23 1800. He was the son of John Turner, who died when he was three, and his wife Christian Morrison. 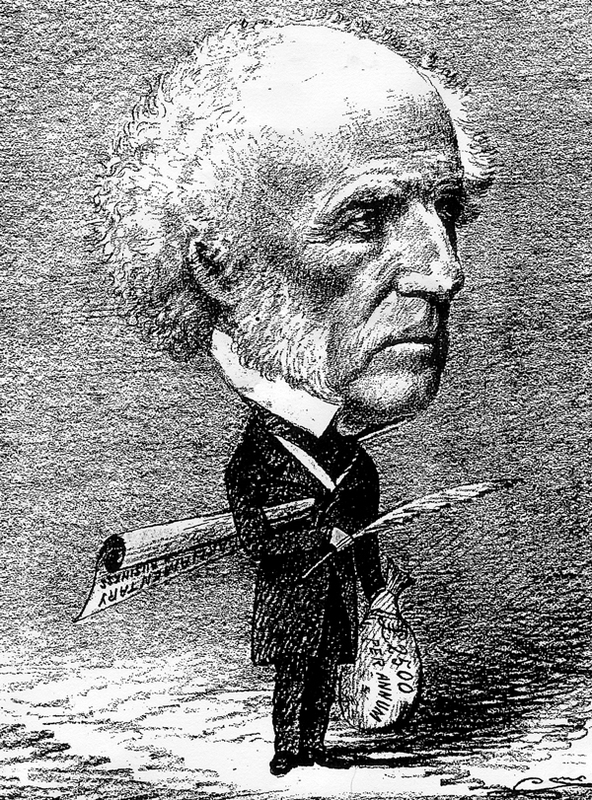 Educated at school in Luss and then Glasgow College, he began a legal career in Edinburgh, but in 1825 he became writer to James Reddie in Glasgow City Chambers. Five years later he married Mary Graeme of Garvock, Perthshire, in the city’s Barony Church. His wife’s family traced back to King Robert lll, and the family was given forfeited land by James VI of Scotland for assistance against the Earl of Gowrie. By 1857 he had worked his way up to the top position of Town Clerk, a post he held until his early retirement in 1872. He was extremely able and conducted the Town Council’s business with real flair — despite being hugely unpopular with councillors and elected officials whom he treated with disdain. An article in ‘The Bailie’ magazine in December 1872 stated: “His uprightness and integrity have never been in question, if now and again he was a little cantankerous. “Perhaps his worst failing was the feeling of contemptuous disdain he entertained towards the Town Council, whom he regarded as illiterate shopkeepers, socially his inferiors, and incapable of deciding intelligently on the questions that came before them. He was also secretary of the Clyde Navigation Trustees, the Glasgow Bridge Trustees, the Port Glasgow Harbour Trustees, the Cumbrae Lighthouse Commissioners, and various other bodies. For some 40 years he was in charge of the city’s parliamentary business, and the numerous acts of parliament relating to Glasgow were prepared and conducted through parliament by him. This meant frequent and often long absences when he was in London. He was a regular visitor to Helensburgh events, according to Donald MacLeod’s book ‘A Nonagenarian’s Reminiscences of Garelochside and Helensburgh’. The author refers to the Public Subscription Library which used to operate from premises at the Old Theatre building in Helensburgh, at the junction of Sinclair Street and East Princes Street, later to become the Municipal Buildings. This service was terminated around 1850, but in its heyday, the proprietors of the Library used to meet for an annual dinner at the Baths — later Queen’s — Hotel. Donald McLeod writes: "Mr Turner, late Town Clerk of Glasgow, was frequently present on these joyous occasions, and so were Messrs L.McLachlan and W.Bain, bakers, Provost Alexander Breingan, David Waddell, Captain Alexander McLeod, the Rev Mr Anderson, and a number of others." A diehard Tory, Angus retired with a pension of £2,500 per annum, equivalent to £113,000 today, and his successor was Edinburgh’s Town Clerk, James D.Marwick, a Liberal more acceptable to the councillors. By now he had become one of the landed gentry, and he set up home at Pitcairns House near Dunning in Perthshire. In 1870 he bought Kippen House, also near Dunning, from his wife’s nephew, Charles Graeme, 15thof Garvock, and commissioned significant changes to it. For a time it was even known as Kippen Turner. He was a Justice of the Peace and a Commissioner of Supply in Perthshire, and also a Justice of the Peace in Lanarkshire. Six years later he took ill, and went to stay with his sister, Mrs Margaret Connal, who was on holiday at Clutha Villa, Wemyss Bay. The weather was poor initially, but on September 9 he went for a swim and drowned. His body was returned to Mrs Connal’s home in St Vincent Street in Glasgow. The funeral was conducted by the Rev R.S.Oldham of St Mary’s Episcopal Church, and he was buried in the Glasgow Necropolis. He was survived by his widow, two daughters who had married well, one grandson, and his sister. All benefitted from his will, in which he also left his butler £100 and all his clothes. A descendant of Angus said: "He felt a great loss losing all his sons in infancy days apart, even as it would have appeared they were past the most present dangers, losses he never really recovered from. "He was a pretty religious chap, funding some portion of the first Episcopalian Cathedral in Glasgow, St Mary's, and in 1870 dedicating one of the windows to his two sons in law who both died before him, which again must have been a great sadness, and two which both daughters never really recovered from. He lost both sons (no.1 & 4) and a daughter (no.3), all within months — first his eldest son John on April 14 1833 from Hooping Cough, then Robert May 30 and Margaret days later on June 2 1839 both from Scarlet Fever. Elder daughter Jane wed Lieutenant Redmond Rideout Bewley Caton, of the 1stRegiment Royal Scots, from Lincolnshire. He was wounded severely in the Crimean War 1854-56 and never recovered, dying in April 1859. Younger daughter Mary wed the eldest son of the Commander-in-Chief of British Forces in the West Indies, General Smyth O’Connor. Angus was one of a large family born at Greenfield. His siblings were Gavin (1788), Agnes (1789), Duncan (1791), Ludovic (1793), John (1794), Stuart (1796), Christine (1797), James (1802) and Margaret (1803). Local historian and Helensburgh Heritage Trust director Alistair McIntyre tells me that people by the name of Turner have had a long association with Luss and the surrounding area, first and foremost as farmers, but achieving distinction in various other fields as well. One place with which they were particularly associated was Edentaggart Farm, which occupies a commanding situation at the head of Glen Luss. Well-known Luss man Ian MacEachern has extensively researched the history of Glen Luss, and he unearthed a fascinating tradition about the origin of the Turner connection. It seems that someone by the name of Lamont had allegedly killed a man, and he was forced to flee his home territory, ending up at the parish of Luss. In order to help cover his tracks, he took on the name of his occupation as a skilled wood turner, In Gaelic, “tuairneir”. It is not known exactly when this took place, but whether or not the story is true, a certain Patrick MacInntourner signed a contract with Colquhoun of Luss, dated 1597, giving him a disposition to two farms in the Luss area. One circumstance which might give some credence to the fugitive account relates to the fact that Luss once enjoyed status of a “gyrth”, or sanctuary, granted by King Robert the Bruce in 1315. Under the terms of this enactment, anyone fleeing justice could enjoy protection from retribution within a radius of three miles of the church of St Kessog at Luss. Bruce is known to have had a veneration for a number of saints – St Fillan is one for whom he had a particular affinity – so perhaps the Kessog factor played a part in his decision. The Turner family began an association with Edentaggart Farm which lasted for over two hundred years, their lease being finally relinquished in 1810. Here too there is a spiritual dimension. The name “Edentaggart” translates from the Gaelic as “hill-slope of the priest”, and there are said to be associations with the old chapel of St Michael, lying a little further down Glen Luss. An early and dramatic event to affect Edentaggart occurred during a raid by marauders in December 1602. Known to history as the “Glen Finlas Raid”, this episode is seen by some as a precursor to the Battle of Glen Fruin early in the following year. It might be thought from the name that only Glen Finlas suffered, but in fact many other settlements also bore the brunt of the attack. On the likely escape route taken by the brigands on their way north were Glen Luss, Glen ma Caoruinn and Glen Mallan, which all had settlements which suffered violent attack and the driving off of livestock. Edentaggart was one place to be despoiled. Despite setbacks of this kind, the Turners thrived and prospered over the centuries. It is not known if all of that name were related, but as well as Edentaggart, Turners came to hold leases of many different farms, not just in the parish of Luss, but in nearby parishes as well. They were related to the Turners on the Rosneath Peninsula, certainly by marriage, and probably by blood as well. Over the course of time, the extended family achieved distinction in many fields over and above farming. 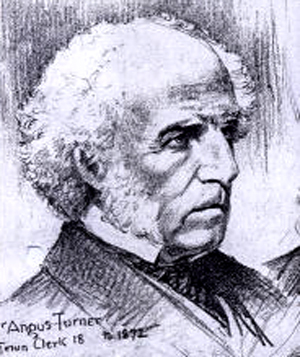 There were lawyers, teachers and merchants by the name of Turner. Several of their headstones in Luss churchyard carry ornate coats of arms, which point to their success and prosperity. During the 19thcentury, quite a few family members emigrated to countries such as the United States, Australia and Jamaica. Given this background, it comes as no surprise that Angus Turner came to achieve high office as chief Town Clerk of Glasgow at a key time in the history of the “Second City of Empire”. Although his father, John Turner, sprang from Edentaggart stock, this was an era of large families, and so John, in common with other siblings, had to make his way in the world beyond the family homestead. John obtained a lease of Greenfield Farm, probably shortly before 1788, while a brother took a lease of Balernock Farm, also on Garelochside. This was a period of radical change in the farming economy, with a massive switch from subsistence farming to one that centred on commercial stock-rearing. Among the indigenous population, it may be that the Turners, with their perceived relative affluence, were better placed than some to make the necessary investment. John Turner died in 1804, and the family would have been forced to give up their tenancy of the farm. How his widow and their large family were able to cope is not known, but it could not have been easy. An obituary notice in the North British Daily Mail of September 12 1876, stated that Angus attended Luss School, then taught by Duncan Turner, described as a relation. That suggests that the family, or at least Angus, was living in the Luss district by then. Given the way in which his future developed, it would certainly appear that he was able to enjoy a sound education, with progression to Glasgow College, a training in law, and his career in local government. His descendants have tried to track down the portrait gifted to the Glasgow Corporation in April 1929, giving something back to Glasgow and city he so loved, but so far without success.